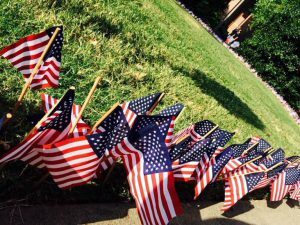 University of Georgia’s Tate Student Center is holding a 9/11 memorial service this morning. Here is a picture from flags lining Tate Lawn this morning. Naome Seifu is there. We’ll bring you updates on the story as it develops. There will be another 9/11 memorial ceremony at the University of Georgia chapel featuring FBI agent Gina Young this afternoon at 3 p.m. We’ll provide you with updates from the ceremony this afternoon. Clarke County Schools have received a nearly $20,000 grant from AthFest. Reporter Russell Abad is finding out how the school district will spend the money. In sports, a local rivalry between Jefferson High School and Commerce High School will take place tomorrow. Reporter Pauline Villanueva tell you how they’re preparing for the game tonight at 5 p.m.